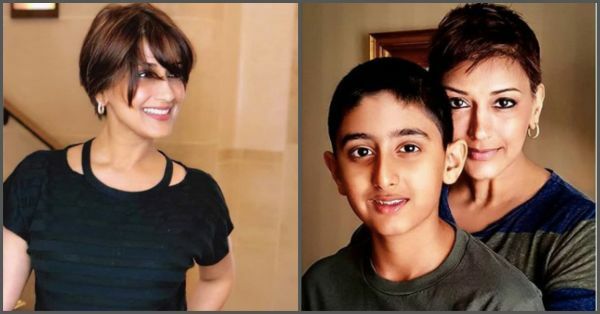 Bollywood actress Sonali Bendre has showed the world that she's a real fighter! On July 4, she announced on social media that she is suffering from cancer. Her post said, "Sometimes, when you least expect it, life throws you a curveball. I have recently been diagnosed with high-grade cancer that has metastised, which we frankly did not see coming." A few days later, she posted some pictures of her new haircut and how she's taking one day at a time and staying positive. As difficult as it must be to openly share this information to the world, it must be even harder for her to break it down to her family members, especially to her teenage son, Ranveer Behl. She posted an image with her son, just a few days away from his 13th birthday. Read her heartfelt post here. We felt deeply for the family reading this beautifully articulated post by Sonali, especially the part where she says, "As much as we wanted to protect him, we knew it was important to tell him the full facts."